Han’s Worst Hits of the 70’s– the year is 1975 and they were billed as ‘ the biggest group since The Beatles.” The Bay City Rollers were making their Scottish Invasion of the United States and the hype machine was going full blast. I was surprised in doing my research at how huge The Bay City Rollers were in the United Kingdom. From 1971- to 1976 they had 10 Top 10 songs in the UK- with 8 of those 10 being within the top 4 and 2 going to #1. Luckily for me in looking at the titles I don’t think I’ve ever heard any of those ten songs. Oddly enough the single they are most remembered for in the United States- Saturday Night-didn’t even make the charts in the UK but it went to #1 in the United States becoming the first #1 song of 1976- America’s Bicentennial year. The song is very upbeat and memorable- it does stick in your head when you hear it and I found it as annoying as hell- especially the spelling out of S-A-T-U-R D-A-Y . As it turned out the Bay City Rollers weren’t the biggest group since The Beatles. I remember seeing their American debut on the short lived Saturday Night Live with Howard Cosell show [an attempt to make Cosell the next Ed Sullivan} Cosell gave them a big build up. The Bay City Rollers to me were always big build up- an attempt to sell an inferior product to the public. Teenybopper music. 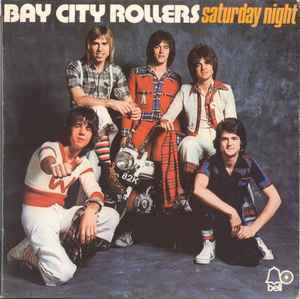 The Bay City Rollers had six Top 40 hits in the US- nothing came close to being as big as Saturday Night and by 1977 they were gone. They still were around but their popularity was gone and they were off the airwaves. They had been replaced in Teenybopper hearts by the likes of Leif Garrett and Shawn Cassidy. I only know the one song- that was enough! End of our second year at big school – we were 14. The teacher buggered of somewhere and the girls drew Osmonds and Bay City Rollers logos on the blackboard. I think my ‘fave’ group then was Cockney Rebel. I don’t think I’ve ever heard of Cockney Rebel but I am willing to bet they were better than the Bay City Rollers and The Osmonds! You’ve never heard ‘Make Me Smile (Come up and see me)’ ??? A staple of UK radio. Ok, potted history. Steve Harley was/is the main man. Did two excellent albums ‘The Human Menagerie’ and ‘ The Pyscomodo’ . The first did not have Judy Teen on until the bonus era. Judy Teen was the break out hit and is terrific. The band then fell apart big time – I think one was killed in the Lockerbie Jumbo Jet crash. The third album ‘Best Years of our Lives’ has ‘Come up … ‘ which is really nasty about his ex guitarist under the guise of a lovely pop song. He did one more ok album with a version of ‘Here Comes The Sun; and then released mostly sh*te. They never had a hit in the US- Make Me Smile was their closest at #96. Their albums didn’t chart either- we lived a sheltered life over here. Ok, I’ll admit that I’m a new follower of slicethelife, but I don’t see the point of these “Han’s Worst Hits of The 70’s” posts. Am I missing something? Just a post I’ve been making on a regular basis. The Bay City Rollers – Another brilliant band! By the way – i just read that we have lost Daryl Dragon – I am sure that you are very broken up about that – I know he was one of your favorites – ONLY JOKING! I saw that- I didn’t mind him- it was Tennille who always annoyed me! I was a kid for this music. Never thrilled me. Their haircuts always looked like bad wigs. They were odd looking I didn’t get it.